Trail Running around Cairns: The Cairns Botanical Garden Red/Blue Arrow Run. | LEADER OF THE TRACK. Whilst in Cairns, I had the opportunity of exploring the beautiful City of Cairns, situated in tropical North Queensland. The best time to visit Cairns is in September because the temperature is perfect, the sun is always shining and the humidity levels are manageable. Cairns is also one of the best destinations I have been to for trail running because surrounding the city are stunning, lush rainforests with so many rainforest walks and trails to explore. 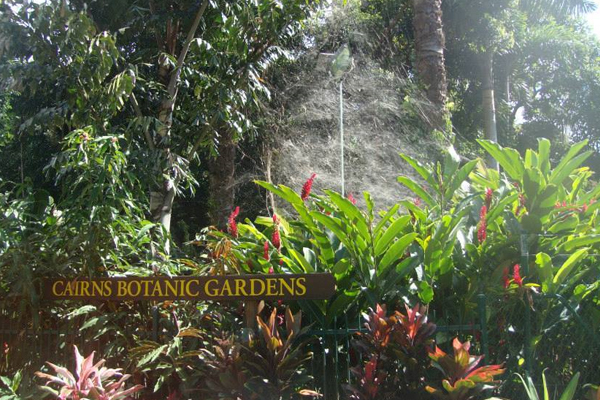 One of the best locations I visited was the Cairns Botanical Gardens. I decided to go for a long run from my hotel and followed a river which then directed me towards the gardens which almost felt like an oasis when I arrived. Having been up to the Daintree the day before, the gardens almost reminded me of the same surroundings. I followed some signs which directed me towards the “Red Arrow Walk” and when I began the run, the realisation of why I love trail running, overcame my mind, body and soul. The 1.3 km Red Arrow circuit is one of a pair of tracks leading up the Mt. Whitfield Conservation Park behind the Cairns Botanical Gardens. The hike takes approximately 40 minutes to one hour to complete, has fantastic views of the natural environment, is frequented by beautiful looking people, and can be walked or run no matter what your fitness level is, the Red Arrow is the track of choice. Beware the high number of steps along the path – they are superb for exercising your legs, but can be a pain after the first hundred or so. Approximately halfway up the Red Arrow Walk, the track splits into two and forms The Blue Arrow walk. This steep climb, which ascends the mountain to a height of 365 metres above sea level, is reserved for those among us that are masochistically fit and yearn for the burn. It is 5.4 km long. It is important that you hydrate along the way, so I made sure I bought some SOS Hydration with me which definitely hit the spot! 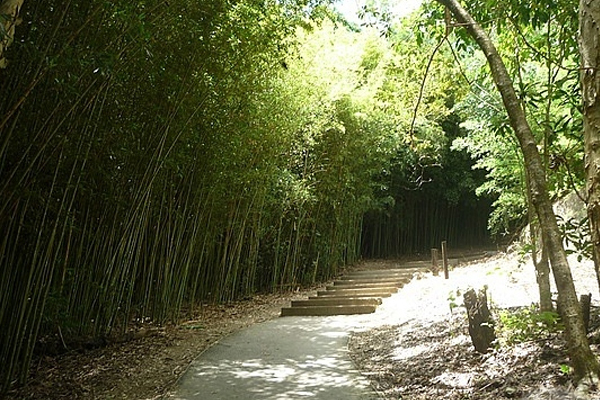 The vegetation on the mountain is predominantly rainforest with patches of eucalyptus, grasslands, and tall bamboo. Scrub Turkeys are everywhere and are very friendly in a turkey sort of way. Agile Wallabies can be seen in the early morning or late afternoon in the grasslands, however they are much shier than the turkeys. Along the path are informative signs that provide details of animal and plant life, including birds. 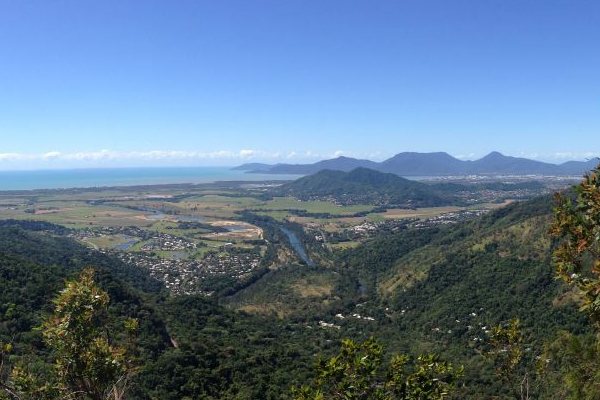 At the top of the Red Arrow walk is spectacular views of Trinity Inlet, the Coral Sea and Cairns city, and the fresh breeze is a welcome relief from the rainforest heat. I was so grateful I came across this stunning location and I would highly recommend this to any one who visits Cairns. It’s only about 3k out from the centre of the city and it is well worth the visit for those keen trail runners! Make sure you wear some good gripped trail running shoes! I made sure I wore my IceBug Acceleratis RB9X trail running shoes which worked a treat on the trails! For more information head to Cairns Attractions.